Happy Wednesday. The weekend is getting closer! Here are a handful of recent outfits to celebrate Hump Day. I wore this outfit before Christmas when I was in a particularly festive mood. I wasn't sure if the pink and red were too much, but figured the black kind of toned things down a bit. I wore a magenta skinny belt to bring a little color to the dress as well. 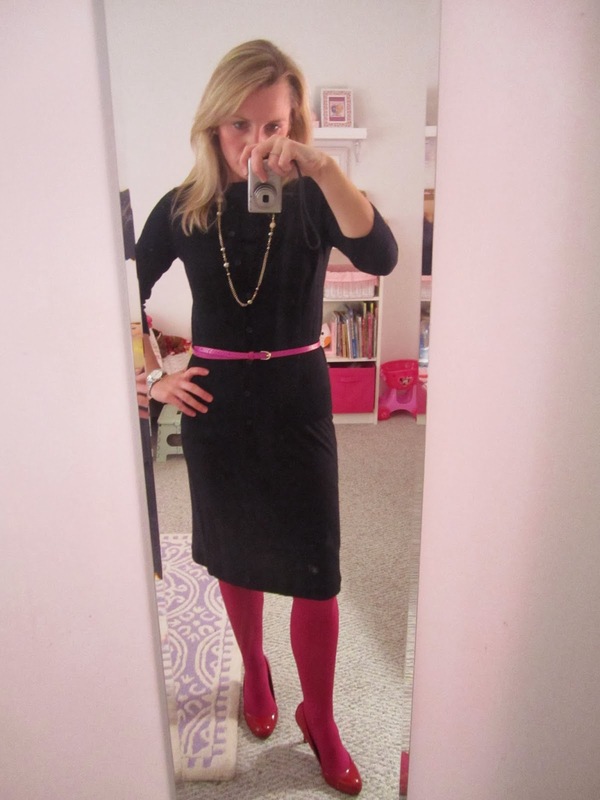 The pinks didn't match perfectly, but I think the outfit worked. Unfortunately, I will remember this outfit as the outfit I wore the day I got the flu. I remember being absolutely *freezing* in my office, and I am never, ever cold. I ran into my boss's office and asked to borrow his space heater, which he let me borrow but he also expressed concern that I was getting sick, since I am never, ever cold. He was right (which I hate to admit). Cute outfit, though. I wore this outfit to work on a casual Friday around the holidays. The shirt is a clearance buy from Gap - I love stripes and will pretty much buy any striped top I can get my mitts on. I really liked the blue detail on the shoulder and at the cuff and appreciated the longer length. The jeans are the same American Eagle skinny jeans tucked into my brown riding boots. I mentioned last week that I lost my mind at the Loft after-Christmas sale. Well, everything arrived and I made out like a bandit. Next week I'll share part of the loot.